PUERTO PRINCESA CITY - Fifteen years ago in my hometown of San Pablo, Laguna, New Year's Eve was a noisy, smoke-filled affair. From dusk of the old year and throughout the night, there would be explosions everywhere, it would culminate in an hour-long, non-stop explosion of firecrackers from all the corners of the city to welcome the stroke of midnight and the arrival of a new year. I was an active participant of these celebrations, and my cousins and I would spend our allowances to the purchase of various firecrackers, which had their colourful, evocative names. There was the Super Lolo - triangle-shaped of compact paper, as well as the Pla-Pla, named after a variety of tilapia fish. A smaller, and tinier ones were the Five-Star and the Three-Star. There was also the giant whistle bomb, which exploded so loudly that it set off the alarms of the cars in the vicinity. My grandmother would lament at the destruction of the fine grass that took a year to grow, but as children, we cared little, spending the vacation days and nights of December lighting the firecrackers, just like the rest of the youth of the town. Today, New Year is literally a toned-down affair in growing parts of the country, with the DOH reporting a 39% decrease of firecracker-related incidents from last year. Of course, the firecrackers are still there, and with them, unfortunate hand injuries, but more and more people are opting for safer fireworks such as the luces and sparklers. Also, what used to be week-long evenings of firecrackers has now been reduced to just a few days, and now it is virtually only the final hours of the year that you will hear the sound of firecrackers. Here in Puerto Princesa, the people I meet make the same observation: it used to be a much grander practice in the best. "Now, only the businessmen and the politicians do it," a local elder told me. From a public health standpoint, this is a great development. It is not only the decrease in firecracker-related injuries that is good for public health, but also the reduction of asthma-inducing fumes, of stroke-trigggering explosions, and fires that deal more damage and injury that the firecrackers that caused them. What can explain the 'silencing' of the New Year? First, the Department of Health deserves credit for all their anti-firecracker campaigns, which has run for decades. In keeping with the times, DOH has also taken to social media to share various facts and statistics about firecrackers, discouraging people from using them, suggesting alternatives, but also providing information on how to use them safely, and what to do in case of emergencies. In this same vein of government intervention, I must also mention the radical measure of Davao City of outlawing firecrackers altogether - a policy now on its 14th year. Second, I would argue that firecrackers are suffering the same fate as the Pinoy games we used to play: children and young people have lost interest due to various things that entertain them better. Mobile phones, Internet, game, have also. This move from the physical to the virtual; from outdoor to indoor; is a trend that has been happening for many years, and is a broad phenomenon beyond the scope of this piece. On the other hand, in urban areas, a growing number of young people opt to follow the Western practice of 'partying' through dusk till dawn of the New Year in clubs, beaches, and other venues. Third, the centralisation and mass-mediatization of the New Year celebrations have diminished the small celebrations, as more people participate in New Year's Eve countdowns in urban areas and through television. With a myriad of celebrities and grandiose display of fireworks and other forms of entertainment, these "countdowns" offer everyone a kind of revelry that is difficult to match by one's own means. In a smaller scale, we also see these in smaller cities, like Puerto Princesa, which offered a public fireworks display and countdown. "We just watch, and it's better because it's free," one woman told me, as she and her son awaited the spectacle at the City Baywalk. Indeed the advances in pyrotechnics have created, once more, a gulf between the rich and the poor, but at least, both can afford to watch the spectacle. Much more can be read of this development in terms of political economy, and we also can look at it as running parallel to the institutionalisation (i.e. medicalisation) of certain things, like childbirth and death. Finally, I would suggest that changing weather patterns can also be partly responsible for the dampened enthusiasm for firecrackers and fireworks. Today, the last day of the year, Typhoon Seniang is continuing to cause bad weather in Palawan, after wreaking havoc in Mindanao and the Visayas. it didn't use to rain a lot this late in the year - an observation that may some meteorological basis. Undersecretary Eric Tayag of the Department of Health actually invoked the weather this New Year's, hoping, as this GMA report cites, that "rainy weather would help minimize the harmful, even lethal, effects of firecrackers on New Year's Eve, especially in Metro Manila." The tradition of welcoming the New Year with fireworks comes from the Chinese, who had invented them, and believed that they can drive away the ghosts and evil spirits. But as traditions go, people who participate in them do not necessarily think of the tradition itself in that way, and do it for their own reasons. When we were kids, we just thought it was a fun and exciting activity. 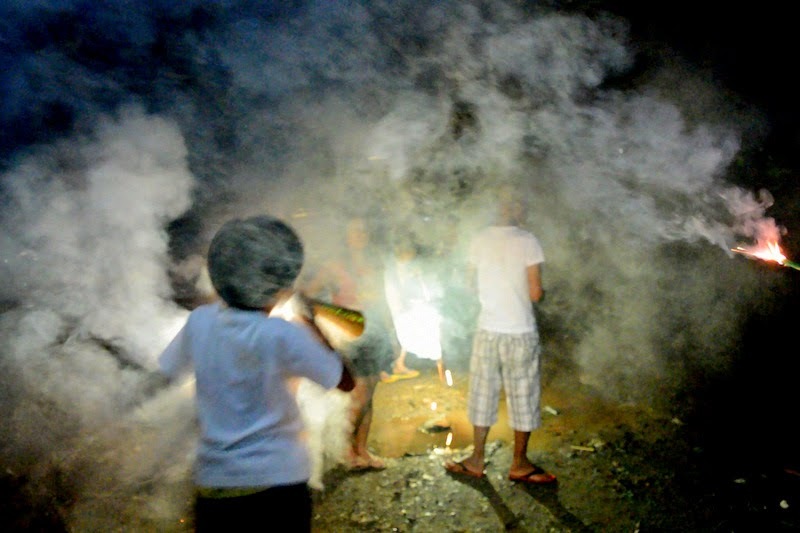 Mostly, it was the boys who did the lighting of firecrackers, and it was a test of pagkalalaki (manliness) to be able to light the firecrackers even with their short fuses. In retrospect, the great thing about the firecrackers is that they were a collective activity, it was social. As such, they create shared memories. My cousins and I will always remember the New Year's Eve when the alarms went off because of the bomb we made, and the bomb that was too big that our grandfather sheepishly suggested that we light it ourselves. The kids of today have their tablets and smartphones to entertain them, and certainly new traditions will come out of it. Just today, I saw my Facebook app offering to take a 'New Year selfie' of me. Facebook allows people to have their own 'audience', and everyone will come up with their own New Year messages. On the other hand, other traditions will continue, such as the assortment of round fruits that find their way in the New Year's eve table. Whatever new 'traditions' might arise, they will certainly be novel ways of sharing, of sociality; a gathering together of families and communities to strengthen their bonds and help them make sense of the passing of tine, a form of communitas, in Victor Turner's terms (cf. Turner, 2012). As a medical doctor, I should be happy with the decline in the firecrackers that will surely save limbs and lives. On the other hand, as an anthropologist, I see this decline as a reminder that traditions are never 'traditional' nor 'static;' they change as people change, and both are contingent on the physical and social environment. Evanescent as the glittering spectacle of baby rockets shooting into the night are our instruments and devices, and as we enter a new year, it is worth remembering that in culture as in life, the only thing that is constant is change. Turner, Edith. (2012). Communitas: The Anthropology of Collective Joy. New York: Palgrave Macmillan.